A kitchen surface repair can be made to any type of kitchen work surfaces regardless of what the item is made from, our team of engineers are fully equipped to to deal with any amount of damage and make sure our kitchen surface repair has the highest quality finish. The item was filled, flattened back, detailed correctly and then textured to give an unmatched finish and unnoticeable repair. Other types of work surface can also be repaired on site within hours check out our other worktop repairs for more info. 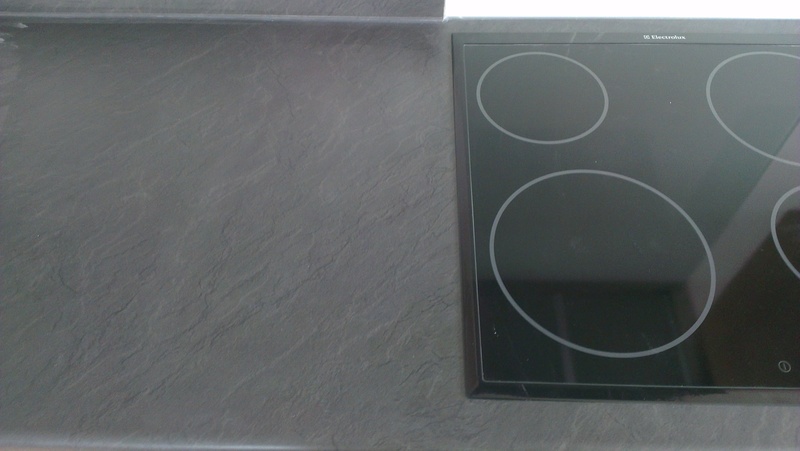 This worktop was damaged by a cleaner on site, the electric hob had been covered by protective sticky back plastic and over a few months the adhesive had become well adhered to the laminate. The cleaner unknowingly made a large score mark across the laminate when they tried to remove the plastic with a bladed scraper. The scratched item was a priority and needed to be repaired as the property was due to be handed over to the client within the next couple of days. Removal of the surface was not an option for the fear of subcontractors damaging more of the kitchen during the replacement. 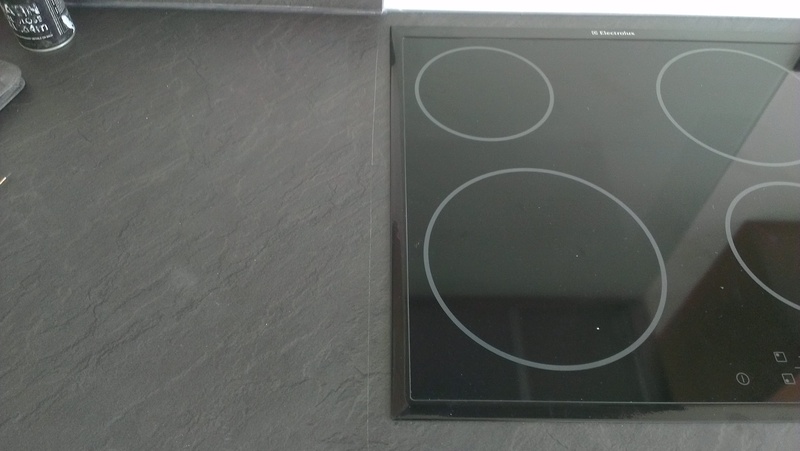 The site agent called Repair and Restore to ask about making this kitchen surface repair after another company had attempted to repair the item and claimed the damage was to large to make an acceptable kitchen surface repair. After speaking to us the site agent obviously refused to let the damage repair company continue with any more works as the standard was unsatisfactory and did not have them back to do anymore work on the site. Repair and Restore were hasty in responding to the site managers call and were paid to do the above sample repair by the dubious site manager before being allowed to continue with any more works on site, our team made many more repairs through out the rest of the week and continue to have a good relationship with the company.